Logitech M570 is the best selling wireless ergonomic mouse with more than 11,500+ reviews on Amazon. It is also the top-rated ergonomic mouse based on customer verified reviews. This is also the ergonomic mouse that I am using currently and have found it to be an absolute delight. Logitech products are one of the finest in computer accessory category. This ergonomic mouse is no different. What makes Logitech M570 a great ergonomic mouse? The best part about this mouse is that you don’t have to move your wrist or arm to use it. There is a trackball that you can use with your thumb to manage the cursor. Performance wise, the trackball usage is very efficient and allows precision in cursor movement. You can use it when working on any surface such as a table, couch, or even bed. It’s a wireless ergonomic mouse with a range of 30 feet. This is more than enough for your work. It also has a battery life of 18 months, which means that your AA size battery would work for at least over a year before it needs a replacement. There is also a battery life indicator that lets you know when you’re about to run out of battery. The mouse has 4 buttons (left/right click and previous/next page buttons) and a scroll wheel. You can also use the free software at Logitech to program the buttons to get common tasks done quickly. This can also double up as a gaming mouse and you can program the buttons according to the game (for example, you can customize the cursor speed). Note that this mouse is made right-handed people only. If you’re left-handed, this mouse is not for you. But if you’re right-handed, this is one of the best ergonomic mouse. This is one of the best ergonomic mouse for wrist pain. It’s also the one I use on a daily basis. It’s priced appropriately and scores high on comfort and ease of use. It’s the only mouse in this list that doesn’t need you to move your hand or wrist to use it. This ensures that there is a minimal strain on your wrist. One feature that differentiates this mouse from every other mouse in the list is its scroll-based use. This allows the user to use it effectively on almost any surface (including bed and couch). This can not be achieved with other optical ergonomic mouse mentioned in this review. Who Can Buy and Benefit from This Product? This product is mainly for those computer users who love playing games. This ergonomic mouse promises to add more fun and thrill to their gaming experience. Also, the M570 will deliver the best performance that will bring their gaming experience to the next level. Logitech M570 Wireless Trackball Mouse is a dark grey mouse with beautiful matte texture contrasted by the bold marble-like blue trackball. The design looks good and modest and not too much loud like other gaming mouse. The material is comfortable to touch. The curved part feels natural which adds more comfort. The M570 has two mouse buttons and between them, you will see a rubber scroll wheel that tends to be extremely resistant. The M570 is lightweight but will stay firmly in place even during your most extreme gaming moment. Thanks to those 4 rubber stoppers underneath. You will also find the on/off switch on the device’s underside and the battery compartment. The device needs one AA battery to work. The device is big bulky and that’s because it needs to brace the trackball. However, that is not a big deal it does not affect the performance of the mouse. The 570 aims to provide everyday comfort. This trackball is stable and will support your hand while letting your armrest well on the table. The device is small and handy, so you can bring it anywhere you are. It works well even if the moving space is tight. The trackball will stay in place, which makes the device ideal for busy desks and tight workspaces. If you should remove the small receiver, tuck it right next to the AA battery. The device itself doesn’t consume much power when used. Therefore, you don’t need changing the battery from time to time. Also, you don’t need to remove the battery after every use because the device has a power on/off button. Just switch off the device when not in use to save power. There is also a light indicator that will tell you if the device is on or needs a new battery. Convenient Controls – this trackball mouse has easy to reach forward and back buttons. They make moving from one page to another easier. Trackball Comfort – the sculpted shape of the device will support your hand and will stay in just one place. You can move the cursor while your arm stays in place. Long Battery Life – this trackball mouse can last for up to 18 months. Easy to Clean – the tracking ball is easy to remove if cleaning the device is necessary. Plug N’ Play Connection – the nano-sized wireless uniting receiver will stay in your PC. All you need to do is plug it and do what you want to do. In fact, you can add a compatible wireless device without the need for more USB receivers. Mouse Dimensions – the device measures 5.71 inches by 3.74 inches by 1.77 inches. Receiver Dimensions – 0.57 inches by 0.74 inches by 0.24 inches. Receiver Weight – 0.06 oz or 1.8 g.
Logitech M570 Wireless Trackball Mouse is responsive if pitted up against the gaming matrix and everyday task. The extended battery life guaranteed by Logitech and the device’s versatility when you use on any type of surface. This product guarantees a reliable and solid performance, combined with a range of discretionary features to improve the experience. However, your personal experience can be different if you have small hands. In that case, your fingers may struggle to reach and touch the browser buttons and scroll wheel. Other than that, there are no possible problems that you may encounter when using Logitech M570 Wireless Trackball Mouse. If you’re using Windows, you must install the Logitech SetPoint Software as there are more options for customizing the trackball. These choices include assigning the five buttons to certain commands, fine-tune trackball movements, check the battery status, and customize the settings for the better gaming experience. Installing the Logitech SetPoint Software is easy and will take a few minutes. If your preferred operating system is Mac, then you should install the LCC connection utility. This will form a Control Center choice in your preferred system. 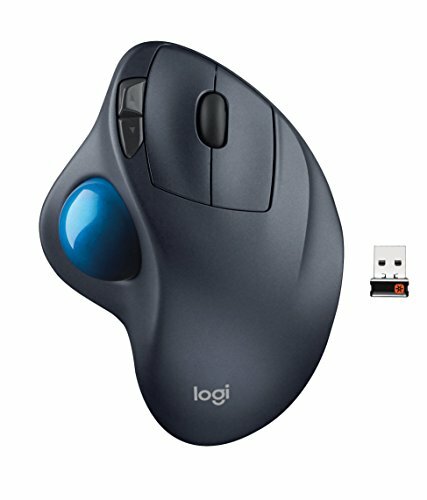 Logitech M570 Wireless Trackball Mouse is a good alternative for ordinary computer mouse due to its excellent advantages. The device has accurate cursor control. It works efficiently on almost all surfaces. Using a trackball is not easy at first. One will take time to learn and master it. The browser buttons are far from where your fingers rest. Logitech M570 Wireless Trackball Mouse provides what the older models have provided in the past but with a little new to satisfy you more. You don’t need to move the device in operating your computer. It also has excellent accuracy to boot and swift cursor speed that you will enjoy especially if you’re an expert user. Likewise, the unit adds some technological improvements which are a must for every mouse that belongs to this generation. This updated version seems to be a good option for both casual and professional users. However, the decision is up to you. Consider your needs and choose the trackball mouse that can answer all your desires and expectations. Best Ergonomic Mouse for Small Hands.